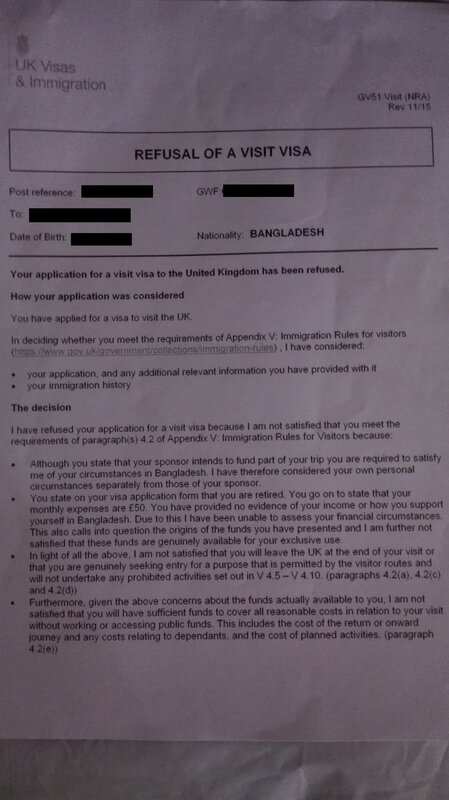 My mother (aged 62) applied for UK visitor visa from Bangladesh recently and got refused. She was intending to meet her elder sister who is a British Citizen living in London. As they haven't met for a long time and my aunt is not in a health condition to visit Bangladesh, my mother wanted to visit her sister on her short holiday at London. You state on your visa application form that you are retired. You go on to state that your monthly expenses are 50 GBP. You have provided no evidence of your income or how you support yourself in Bangladesh. Due to this I have been unable to assess your financial circumstances. This also calls into question the origins of the funds you have presented and I am further not satisfied that these funds are genuinely available for your exclusive use. She is very shocked at this and we are planning to re-apply and submit a new application. Although she is retired, in the sense that she doesn't work anymore, but she still has documents which could be presented to prove her proprietorship of the company. My question is how should we deal with this problem in the next application. What should she mention in the place of occupation? When we mention she was refused a few days ago, then where and how do we write the explanation? 4.2 (a) + (c) this is basically their way of saying that your mother is not a genuine applicant and they think she will go underground after she arrives. We have lots and lots of this type of refusal already in the archives here on the site, you will benefit from reading them. 4.2 (e) this tells us that they concluded that she did not have sufficient economic resources at her disposal to undertake the visit. We have lots of refusal notices citing this paragraph also. Combining the two reasons together allows us to infer that in addition to going underground, your mother will ultimately become reliant on public funds, and when she is finally caught they will have to go through the rigmarole of detention and removal. Plus an Article 8 case, which further depletes public funds. The combination of these two reasons makes your situation unique, otherwise your question would be closed out as a duplicate. Part of their conclusions are drawn from the risk profile of your mother's demographics: Bangladeshi, elderly, retired, female, settled family in the UK, no apparent source of income, and so on. These risk profiles are not available to the public, but we have to assume that their performance history is poor. Maybe it's fair, maybe it's not, but at the moment it's part of "what is". Accordingly Bangladeshi nationals have to use extra diligence when they apply for the Standard Visitor Visa. Based on what you wrote, she is receiving income from the black economy, i.e., away from record-keeping, away from taxation, opaque sources, away from criminal detection, and generally away from money laundering detection (a big one). This is a sure-fire recipe for for getting them worried because the legality of her income is questionable. They are entitled to refuse on this criterion alone. Side-note: it is the same refusal formulae they use for "funds parking"; even though they didn't get her on funds parking, you can benefit by studying those types of refusals because there is a connection. This site has a very rich anthology of funds parking refusals. Obviously your mother's income stream(s) will need to be legalised and made transparent. And the arrangements will need to be in place for quite some time before they are satisfied that you are not simply painting them a picture. If they think you are painting them a picture they will use the discrepancy method to refuse again and then matters will be worse. We have seen situations where people put in a quick fix and then got refused again and thus entered into a tailspin of serial refusals. Avoid that outcome! Secondarily, her lifestyle and personal circumstances should be altered such that your mother no longer falls in to a high-risk profile. Whose 'turn' is it to visit your aunt for example. What does she actually do in her retirement that she could not do living with your sister in the UK? The prescription here is something you cannot find on the net because it is tightly wrapped to lots of personal information. There are regulated solicitors in the UK who specialise in standard visitor visa refusals of Bangladeshi nationals (a fee earner), some will do 'pro bono' work, but most will charge a fee (visiting the UK is not a human right). Check out the Law Society and the OISC register. Importantly, avoid scam artists in South Asia who operate as 'visa experts'. What should she mention in the place of occupation? Wrong strategy! You should put down exactly what it is. Read the part about 'painting them a picture' above. There is nothing wrong with being retired in itself, painting them a picture on the other hand spells DOOM for many applicants. I surely hope this answer has put you off the 'few days ago' strategy. The cure is more complex than that and serial refusals will make matters worse. ...then where and how do we write the explanation? There is a place to list prior refusals on the form, and a place to enter free text. A solicitor will know what to do. Note: You can check the archives by following the visa-refusal tag. Note: 'funds parking' is our own term to describe and categorise this very popular strategy. Accordingly there is no point in trying to Google it. It's "in-house" terminology. There's some graphic representations here: Should I submit bank statements when applying for a UK Visa? What do they say about me? Disclaimer: I know the linked solicitor personally, she is a fee earner, not a charity. Not the answer you're looking for? Browse other questions tagged uk visa-refusals proof-provenance-of-funds or ask your own question. Visa refusal. Should I reapply or appeal? Can I prevent a second visa refusal if i have a sponsor (havin good finances)but my finances haven't changed?